We cannot deny the fact that identity theft has become the number one crime not only in the US but everywhere around the world. 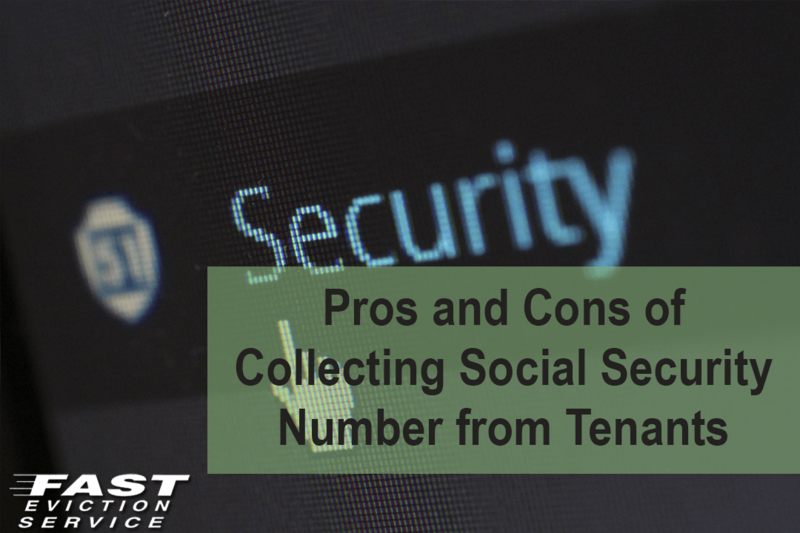 This is why renters have become increasingly hesitant in providing their Social Security Number to landlords because they cannot trust a person whom they have met just once or twice. On the other hand, landlords need this information to perform security screening of the prospective tenants since Social Security Number (SSN) tends to validate the authenticity of the person. Collecting SSN is an essential part of the screening process. Nowadays it is all the more important to be sure about the individual(s) you will be renting out your property and ensure peace of mind. If you don’t want to go through the troublesome tenant screening process then you can hire third-party background screening firms that perform screening including criminal background check. However, to inspect a prospective tenant’s credit report, you will still need to provide their SSN to the firm. In case your tenant fails to pay the rent, you cannot do anything but either file a lawsuit against him/her or hire a third-party debt collections agency. In this scenario, the agency will ask for the tenant’s SSN. Safeguarding such important information, which is of highly sensitive nature, is going to be very difficult for you as a landlord. Statutory laws regarding storing and securing SSN vary to a great extent and you must confirm the laws in your state about storing personally identifiable information otherwise you may not be aware that you have unknowingly broken the law. In case the tenant faces identity theft issue, you will be the first person to be held liable on the ground that you failed to protect his/her information. Landlords find themselves at the top of the suspect list when the identity of a tenant is stolen and landlord has the SSN. When you ask for the SSN from prospective tenant, it can possibly create distrust as the tenant may think you doubt his/her intentions and credibility. Why is it Better to Skip Collecting SSNs? The primary reason why landlords ask for SSNs is to run a credit check. However, the application fee of many screening firms is way too high and often not worth the risk. You can easily ask the prospective tenant to provide you his/her credit report and avoid the hassle. Alternately, firms like TransUnion, Equifax and Experian are offering tenant screening services and you don’t need to provide them the SSN but only an email address and tenant’s participation. Criminal reports and court records no more contain the SSN because these records are publicly available and inclusion of SSNs would provide criminals an opportunity to perform identity theft. Therefore, you don’t need to collect SSN from the tenant to run criminal background check just the first and last name of the tenant, his/her date of birth and a recent photograph of the tenant would be enough. If you want to file for small claims or eviction in the court, you won’t be asked for providing the SSN of the tenant in a majority of states. The only information you need is the name and current address of the person. During the court hearing, landlords can request for approval of wage garnishment, which if approved would force the employer to comply without asking for SSN. Wage garnishment is possible even if the tenant doesn’t show up at the hearing. So as you can see, there are several pros and cons for landlords asking for the SSN and its always best to know the inherent problems and pitfalls as well as knowing the work arounds to getting the information you need for effective tenant screening. In most instances, it will be better not to ask for a prospective tenant’s SSN.